See Gibraltar's dolphins wild and free! 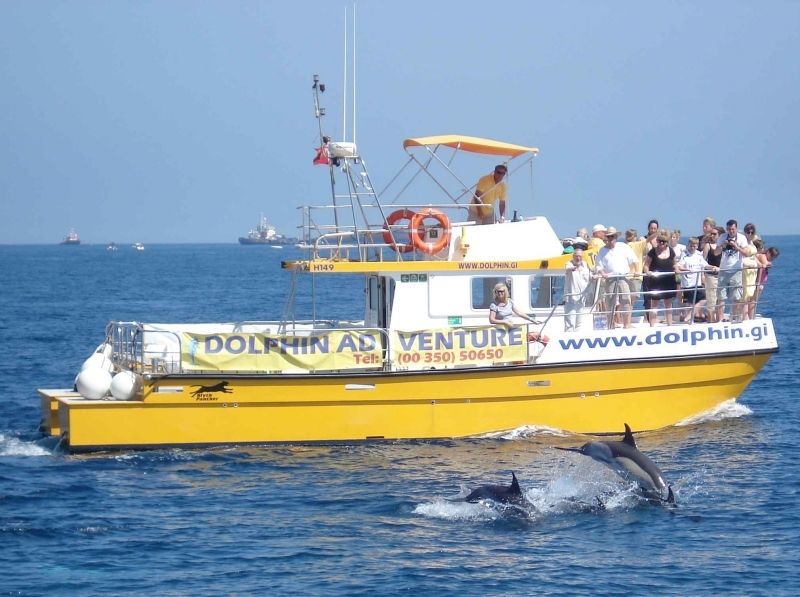 Sail The Bay of Gibraltar with Dolphin Adventure for a wild dolphin safari. The crew and captain will guide you on a responsible dolphin watching tour with on-board marine biologist. A must add to your list of things to do on holiday in Gibraltar or the Costa del Sol. This is simply the best way to see Gibraltar's dolphins, wild and free. Join our experienced, professional, qualified crew to take in the stunning views of The Rock of Gibraltar, Spain and North Africa. Gibraltar is famous the world over for its ever present population of wild dolphins, with transient dolphins visiting the bay and Strait of Gibraltar for food, shelter and to breed in their thousands. Let us take you on an adventure into the world of these enchanting animals. Your Dolphin Adventure captain and crew know best, through years of experience, these dolphin’s favorite playgrounds so you could find yourself among a pod of dolphins as large as 200 or more. You will watch in amazement as they gracefully swim and play around the boat right at your feet in a natural display of acrobatics. Sit back and relax whilst listening to the live commentary on-board our new boats, 'Dolphin Adventurer' and 'Dolphin Adventurer II'. They have been custom built to our own design, and are crammed full with state of the art electronics and safety equipment, with seating for all passengers. They are built to the latest UK safety regulations, giving you peace of mind for yourself and your family. The massive twin hulls give the smoothest of rides and incredible stability. At almost twice the width of most boats, passengers can enjoy a 360° frontline viewing area guaranteed to give all passengers a great view. There is even a raised viewing platform giving superb views of the dolphins. In the summer of 2006 we sighted a lone juvenile bottlenose dolphin in the Bay of Gibraltar in among a small pod of young striped and common dolphin. This is quite out of the ordinary as the bottlenose dolphins tend to stay out in the Strait of Gibraltar, a few miles away. It would appear that Billy has been adopted by this mixed pod of dolphins and he is now a permanent resident in the Bay of Gibraltar. He has clearly become a very trusted member of the group and is often seen babysitting young and even newborn calves, we have been unable to find another case like this anywhere in the world.